Rev. Johannes Heinrich Hopp was born in the Volga German colony of Frank, Russia on December 14, 1869, the son of Heinrich and Barbara Hopp. Johannes was consecrated as a child of God in holy baptism and confirmed in 1884 after nine years of schooling by Pastor Karl Rudolph Roos. It was said that in his youth Johannes displayed a passion in his heart to step into the service of God. Johannes married Charlotte Miller on February 2, 1889 and they became parents of six children: Anna, Johannes, Lydia, Marie, Karl and Charlotte. In June 1893, the Hopp family came to the United States and initially settled in Lincoln, Nebraska where he worked for a number of years in business. Photograph of Rev. Johannes Hopp courtesy of The Center for Volga German Studies at Concordia University. The handwritten inscription on the back of this photograph reads: "To Katie Schlitt from Pastor John H. Hopp, Portland, Ore., April 3, 1912." Following his desire to serve God, Johannes was advised by Pastor Grove to visit the Wilton German English College in Wilton, Iowa. Johannes made a decision to enroll in 1898 and he graduated from Wilton in May 1901. In September of the same year, Johannes entered the Chicago Theological Seminary. During his time at seminary he served at one of the German churches in Chicago. 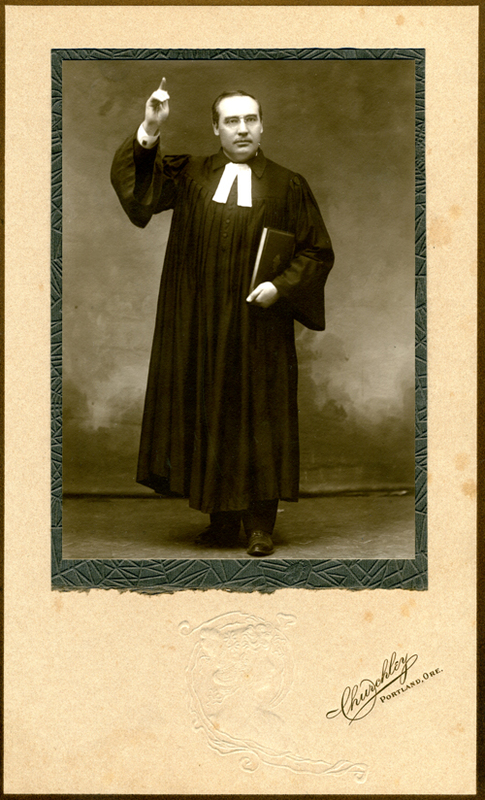 After graduation from the seminary, Johannes was appointed minister of a small congregation at Park Ridge, Illinois. In June of 1903, he received a call from the Ebenezer German Congregational Church of Portland, Oregon, where he was ordained on July 27, 1903. The Ebenezer church had been founded by Rev. Johannes Koch in April 1892 and had grown to 70 members by 1903. The new assignment for Rev. Hopp was supported as a mission church by the general board of the German Congregational denomination. 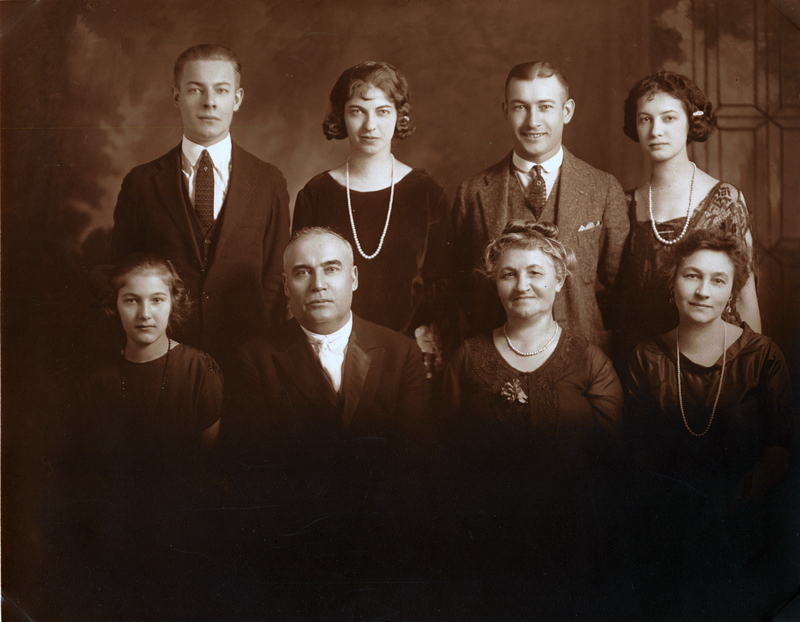 As more Volga Germans continued to migrate to Portland from other parts of the United States, Canada and directly from Russia, the Ebenezer congregation grew. A decision was made in 1903 to build a new church on the existing site and Rev. Hopp led this effort. The new building was dedicated in December 1904. The Ebenezer German Congregational Church at NE 7th and Stanton was completed in 1904 under the leadership of Rev. Hopp. 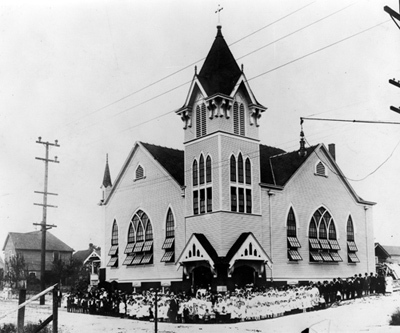 According to the Minutes of the Congregational Conference of Oregon published in 1913, the Ebenezer congregation had grown to 285 members (150 males and 135 females) in 1912. The Zion German Congregational Church congregation circa 1914. This article was published in the "Sunday Oregonian" on July 19, 1914 (page 15). Rev. Hopp was active in supporting the Volga Relief Society that was founded at the Zion church on August 11, 1921. The society was formed to provide assistance to friends and family living in Russia who were victims of a severe famine during the early 1920s. In 1922, Rev. Hopp was influential in bringing the former Free Evangelical Brethren Church under the German Congregational denomination. The church was renamed the German Congregational Evangelical Brethren Church at that time. This congregation had formerly been served by elders who were not ordained ministers. Rev. Hopp was instrumental in persuading Rev. Wagner (also a graduate of the Chicago Theological Seminary) to serve this church. 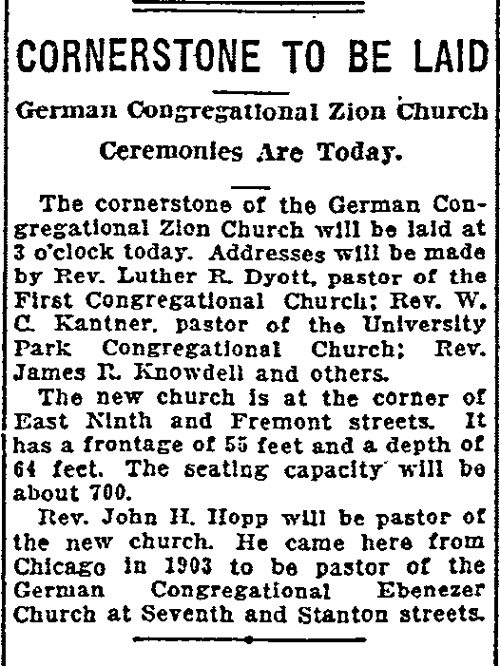 In August 5, 1928, the Zion congregation celebrated the 25th anniversary of Rev. Hopp's pastorate with three services held in his honor. Speakers during the day included Rev. George Hein of Seattle, Rev. John Hoelzer, General Missionary of the Congregational Church from Denver, Rev. C. H. Harrison, the Oregon State Superintendent of the Congregational Church and Judge Jacob Kanzler. 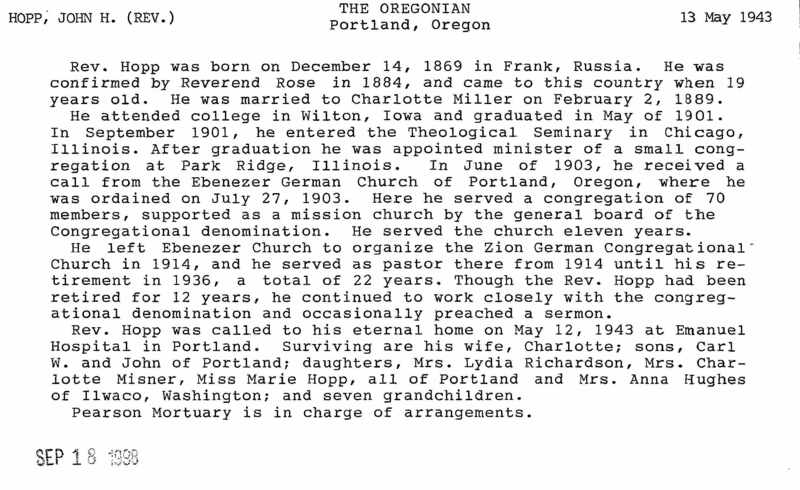 Pastor Hopp served the Zion church for 22 years and was a very influential force in the Volga German community. On August 31, 1936, Rev. Hopp withdrew himself from public service in the community and lived partially in retirement, although he was always willing to help out where necessary. Rev. Hopp was a handsome man who met people easily and had a suavity of manner that helps to explain why he was able to keep the loyalty of his parishioners. Because of his long residence in Portland, Rev. Hopp was of great help to the members of the church who wished to take out citizenship paper or needed legal service. Rev. Hopp also served his community for many years as a member at the prisoner association where he made it his duty to help many unfortunate people find a new beginning. On March 18, 1942, Charlotte Hopp was taken from his side by death, after they had carried joy and sorrow with one another over 53 years. In September 1943 Rev. Hopp married the widow Lena Behm, who became his faithful companion and aide. On Wednesday May 12, 1948, when Rev. Hopp was in the process of preparing for a state conference in Ritzville, Washington, when he suddenly became ill. That evening he was taken to Emanuel Hospital in Portland. The physicians did all that was humanly possible, but the next morning at 6:30 a.m. he passed away. A very well attended funeral service was held for Rev. Hopp on May 17, 1948 at the Zion Church. Pastor Theo. C. Strobel was the leader of the service and contributions to the concluding sermon were made by Pastor W. Essig, Pastor J. C. Schwabenland, Pastor H. Beder, Pastor H. Hagelganz, Pastor Geo. Hein, Pastor D. J. Tiede, Pastor R. Walter and Dr. Paul A. Davies, Superintendent of the Oregon Conference of Congregational Churches. Following the service, Rev. Hopp was taken to his final resting place. Obituary for Johannes Heinrich Hopp, Der Kirchenbote Kalendar 1949. Obituary for Rev. John H. Hopp, The Oregonian [Portland], May 13, 1948. "Church To Celebrate - 25th Anniversary of Pastorate of Rev. John H. Hopp to Be Observed Today." The Oregonian [Portland], August 5, 1928, page 11. The Wilton German English College merged with Redfield College, in Redfield, South Dakota, in 1904, forming "a Christian institution of learning under the general supervision of the German Congregational churches of the United States of America," with the mandate "specifically to provide an academic and college course for all German young men looking toward a German Congregational ministry." When Redfield College closed in 1932, the theology program was transferred to Yankton College in Yankton, South Dakota.